Stick Close to Me - I'm Lucky!! Well, I'm one lucky duck! Yesterday an unexpected package arrived in the mail from my wonderfully talented Bead Soup partner, Becky Pancake ( I love her name--makes me think of the smiley pancakes I use to make for the kids. I'm sure she always has a smile on her face!) What a surprise! 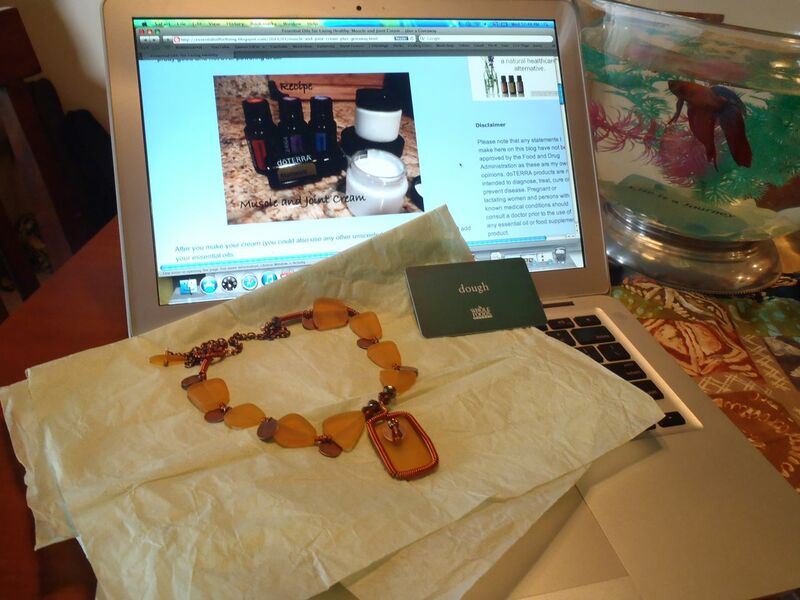 Last month she was having a giveaway of a beautiful sea glass necklace to celebrate the 1st Birthday of her blog. I won!! Woohoo! Yep, that's it in the photo below. She designed the necklace and some other lovely jewelry for www.znetshows.com - you can see them on her blog. 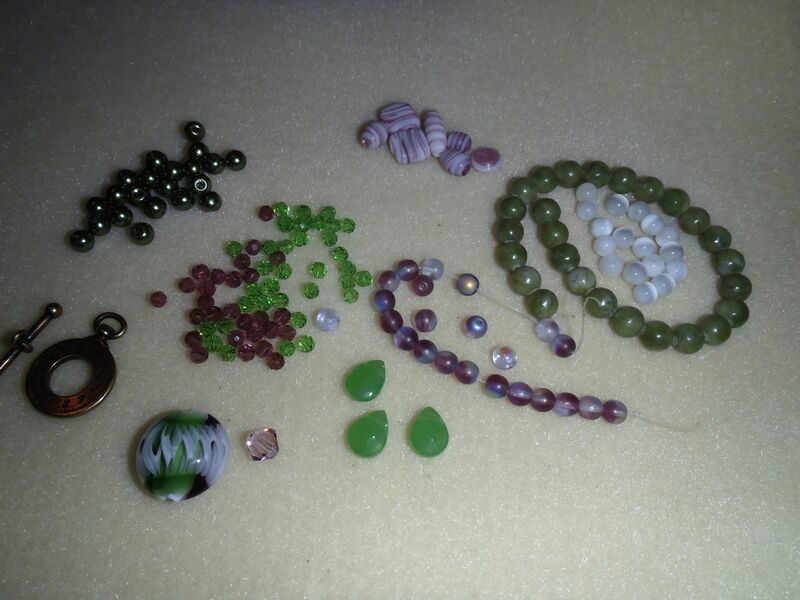 I've been playing with my yummy bead soup she sent but I can't show you until the big reveal day--that will be April 6th for us. Be sure a check back then for our cooked soups. There are so many participants this year, Lori has broken up the party to 3 reveal days: 1st is on March 30th, 2nd on April 6th and 3rd on April 13. Visit as many of the blogs as you can. There will be wonderful eye candy!! On each reveal day, I'll post the list of blogs for that day's Blog Hop Parties. Curious about the other things in the photo? So was Rocky Balboa, my Siamese Fighting Fish (he's really a friendly guy and not a fighter!) . . . .
On the computer scene is some great muscle and joint cream my friend Dana James whipped up and was giving away a one ounce jar to a lucky follower... ME!!! I won yet another prize!! In addition to fabulous jewelry skills (go here for Dana's Jewelry website) she has become interested in doTERRA essential oils and their numerous health benefits and uses in other areas of our everyday healthful living. Check out her Essential Oils blog HERE to learn more. She has some great recipes for all kinds of things you'd never think of in addition to information and recipes in using oils for improving our overall health. Monday's recipe was for homemade laundry detergent! A couple weeks ago was one for natural fabric softener dry balls I can't wait to try. And the little green card?? It says 'dough' and it's a $20 gift card from Whole Foods!! While I was there yesterday picking up some of my much needed gluten free products ('dough' > gluten free flours hahaha, they didn't even get the humor in that!) I have to admit I was a little bit cranky having to pay the extra prices for gluten free. But when we when we were checking out, our new cashier trainee asked if we would like to donate to their Whole Planet Foundation. They do good things so why not? She was so excited that we said 'yes' and asked 'How much would you like to give?' Hubby and I looked at each other and both said 'how 'bout $5?'. 'Oh--clap, clap--with a $5 donation you get to spin our Wheel of Fun! '...she was very enthusiastic :) (or maybe not many people were donating yesterday and she was happy to get a taker giver) So I took a spin on the Wheel of Fun! It was like a miniature Wheel of Fortune made out of plywood and cardboard. I won 20 Bucks!!! Doesn't really seem like you should make money off giving a donation but hey, I'll take it! Took the sting out of those high gf prices....and we'll most likely be donating again so it all works out, right? Be sure to donate to Whole Planet Foundation next time you are in Whole Foods and maybe you'll win a free reusable shopping bag...or a Kona Red beverage... or 20 BUCKS!! Hope you are having a lucky week too! Lori pares us up with a partner -- someone we don't know and doesn't work in our style to help us step out of our comfort zone and try new things. (Lori actually visits ALL participants blogs before she pares everyone!) Here is a list of everyone and their websites. I think there were something like 500 people signing up--whoa! One of my favorite things about the Party is getting to meet new people. My new friend and partner is BECKY PANCAKE wave wave--hi Becky :) Of course, first thing I did when I got my partner sign up was to go to Becky's website to check out her creations. 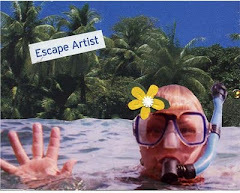 HERE is the page of her blog that I first saw. If you know me, you'll see right away why I had a big smile on my face. Beach Glass!! Yay--one of my favorite things to play with! Orange isn't a color I normally am drawn to but right from the first look, the first thing that popped in my head was 'what yummy colors!!' Isn't that orange and turquoise just the best combination ever?? And the sea glass surrounded by the bead bezel? Gorgeous! I've always wanted to learn to do that and Becky had some great recommendations and a book for me to try--Mahalo! 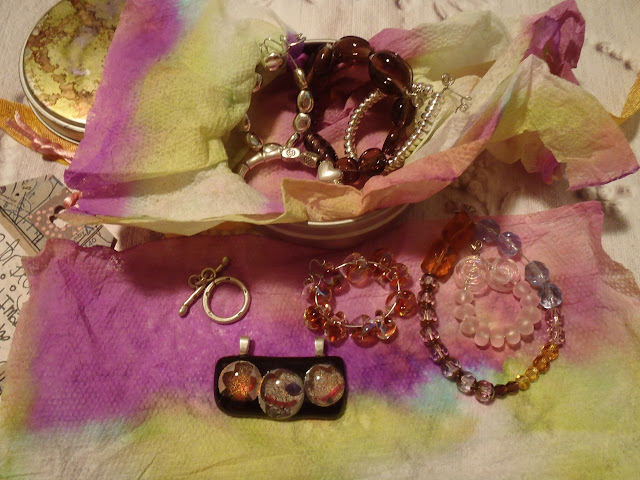 Becky and her lovely creations were picked by the company that makes the glass beads to join them at the Tucson Bead Show--congrats!!! Just read Becky's blog this morning and guess what??? It's her blog's first birthday and she is giving away one of the lovely pieces in this post. Check it out.... and leave a note to enter the give away. Want to see the goodies Becky sent for me to create with??? I started playing with the soup the minute I opened the package. Love the colors! Had to stop myself and even take something apart so I could take a photo to share with you! You don't get to see any of the finished pieces until our big revel date on April 6th. That's our Blog Hop Party day--you can visit everyone's blog to see their soup creations then. The focal bead is a Lampwork Bead by Jeff Barber--simply beautiful! This is kind of embarrassing, but this photo doesn't do justice to my soup at all. Like I said, I took things apart to take the photo because I was so excited to start playing. Quick, snapped a pic and back to playing. Sorry, not nice of me! Luckily Becky took much better photos and you can see them Here. Want to see what I sent Becky?